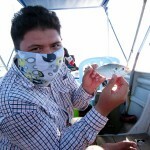 A day before this trip, it was quite positive although the fishing field was quite tough. 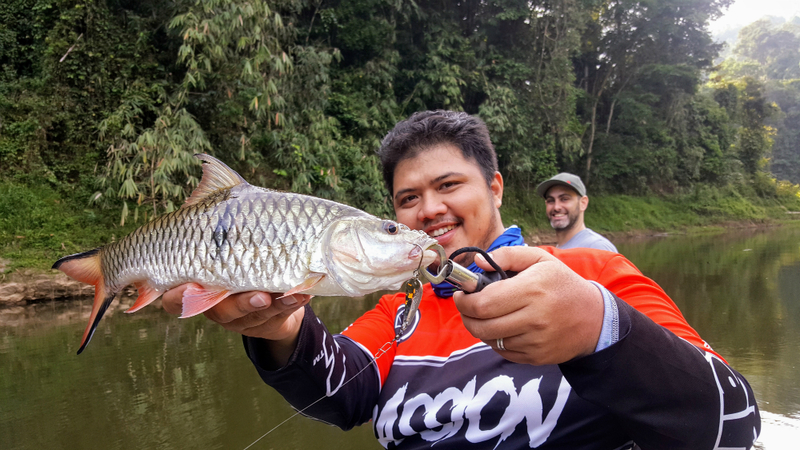 It is always exciting for us, to have a first timer to come here to experience not only fishing but some Royal Belum State Park attractions. At first it was going to be a 2 day fishing trip with an option for a 3rd day. Since this is going to be two boat trip, it will be fun to analyze a bit how we approach our day to day basis. Thus, this will be the beginning of Joel, Troy and Phil Royal Belum Fishing Adventure. First day is the most important day, especially morning session. It is good to get on the scoreboard as early as possible. 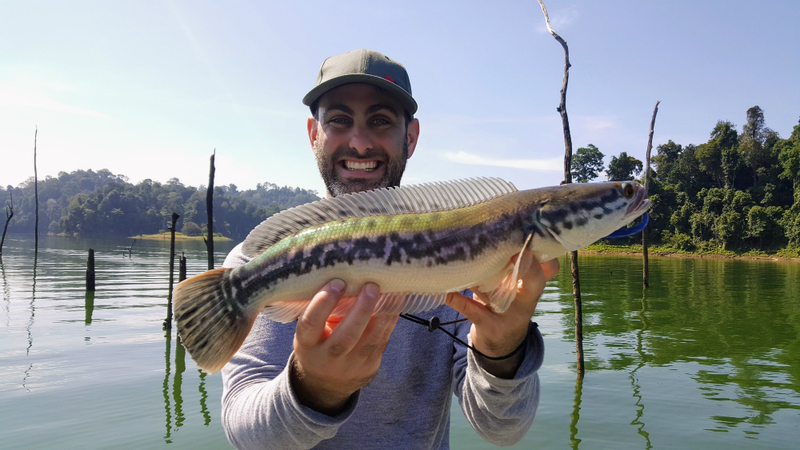 To keep you motivated when it comes too hunting down Giant Snakehead. Eddie head South with Troy and Phil and I head West to Sungai Gadong with Joel. 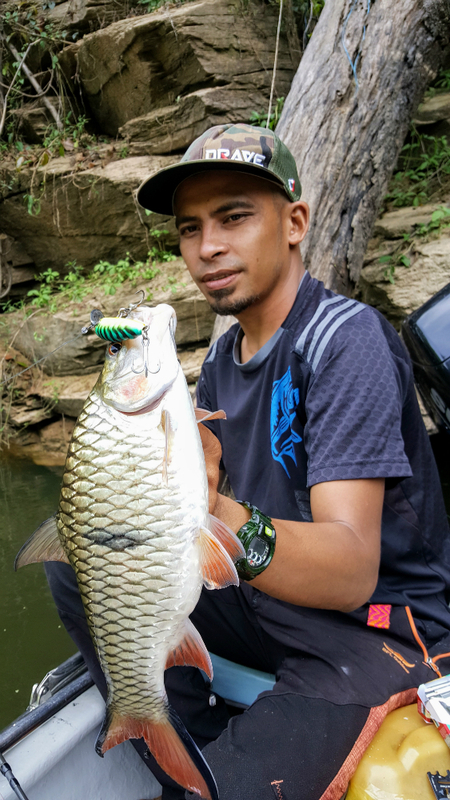 Since August last year, Sungai Gadong or Gadong River has been a hot spot for Hampala Barb. It is a small river system, with a small waterfall. 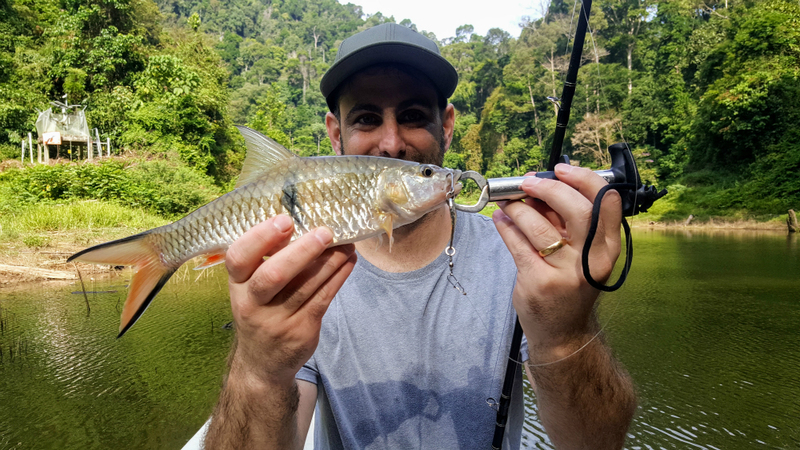 We did catch some smaller size Sebarau last weekend but hoping today the big ones would come out and kick start our party. Hampala Barb or Sebarau. Joel first fish of the day! We did some trolling but nothing hammers it. We stopped at the deepest section of the river and start casting topwater and some spoon to see which is far more effective. It didn’t took long before we start our day with a couple of Sebarau, some are pretty good size. Morning is always better when it comes to fishing in rivers. Fishes would come out and feed. We can see some large Sebarau surfacing and even some Toman roaming around waiting to ambush unlucky Sebarau. The first day is all about familiarizing with our fishing gear, castability and accuracy. Lure fishing is different, you need to place your lure at the right spot to trigger a fish strike. Joel was lucky to experience a unique method on a rubber frog. I notice some Common Snakehead was chasing baitfish close to our position near a patch of branch. He did placing the lure at the river bank and slowly moved that lure into the water. As the line were reeled in, it caught a tall grass and and the lure were pulled out of the water. As it leaves the water surface about half a feet, a snake head jumps out of the water trying to grab the lure. It was epic but it misses it. We stayed for a while before we end our morning session. We head back to one of the houseboat and rested for a while before continuing our journey. One of many Sebarau during our first morning. 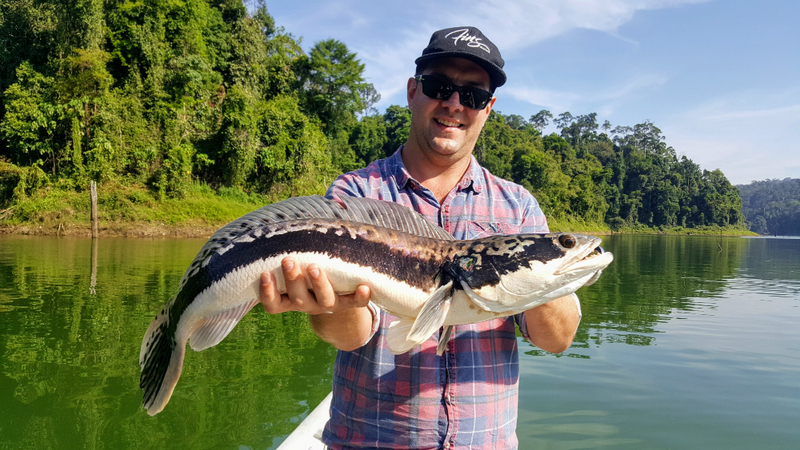 We head further up through Air Banun later that evening to score our first Giant Snakehead. We tried a couple of spot until we came across a group of baby Tomans. We were totally focused in getting this one. We chased it down for about an hour but still it refuses to take all the lure we throw at it. Joel made a couple of of excellent cast but still luck was not on our side today and we will try again tomorrow. Day 2, Joel made a switch with Phil and join Eddie. Looking at day two, Joel made a switch with Phil. Eddie brought some live bait (last resort) option for Snakehead fishing while I decided to stick with lures. Followed the same routine like last night just to get Phil started fishing. Unfortunately our morning session was slow. The Sebarau probably were spooked by our presence last night it we were not getting any result. There are few rises in the area but there just not taking it. One thing to work on was his casting and Phil took some time a bit to get the accuracy right where I needed. Starting from the morning until 2 hours before we ended our day. We have stopped so many location. The Giant Snakehead was just so passive and not aggressive. It was right at the end when we accidentally bumped into a large school of Giant Snakehead. Rises consistently and not spooked easily. Phil tried his best and misses 3 at least that day. Bump the lure, missed strike and just unlucky. He even misses an Emperor Snakehead. It was tough, I felt bad an unfair for Phil. He tried really hard. We head back empty handed but some good news from Eddie’s team. Troy landed a Snakehead on live bait. Troy even loses one right at the edge of the boat but this time on lure. Joel did get a take but could not convert his score. After some discussion they decided to stay another day and try again in live bait. Troy, well Eddie told me he the quite-ess among the two but determined to get one and he nailed it! 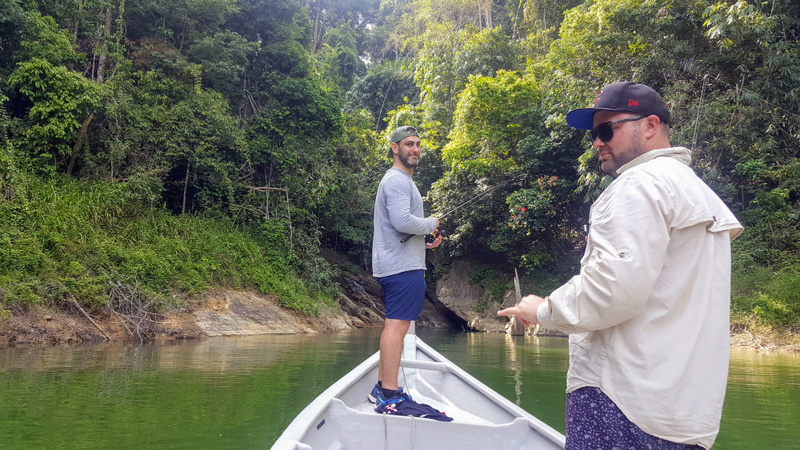 Moving on to our final day of Joel, Troy and Phil Royal Belum Fishing Adventure. 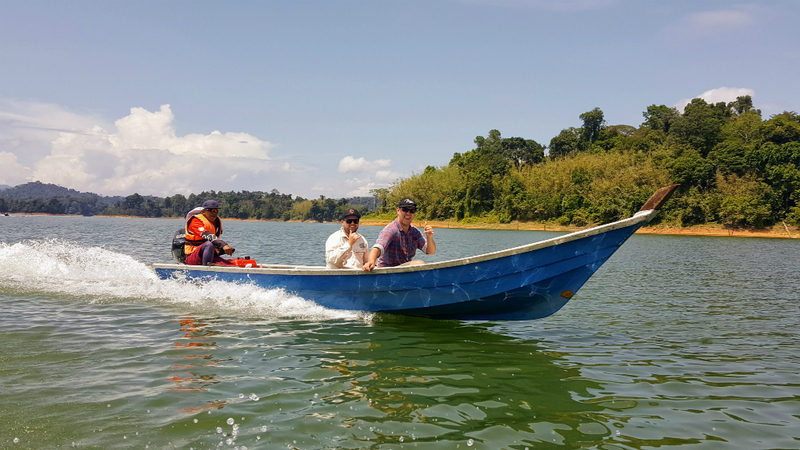 We all decided list night that today will focus 100% on live bait and some visit one of Royal Belum most beautiful waterfall and Orang Asli (Native People) village. 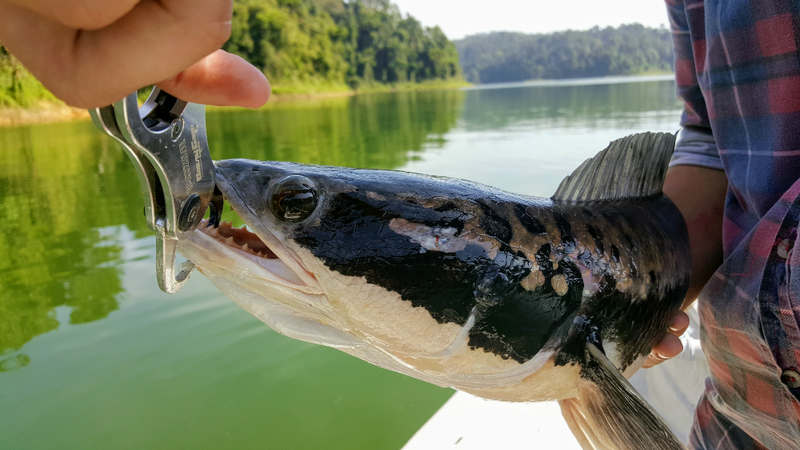 The usage of live bait does the trick as they landed 10 Giant Snakehead. After hearing the news from Eddie, I felt so satisfied all their hard work had finally paid off. 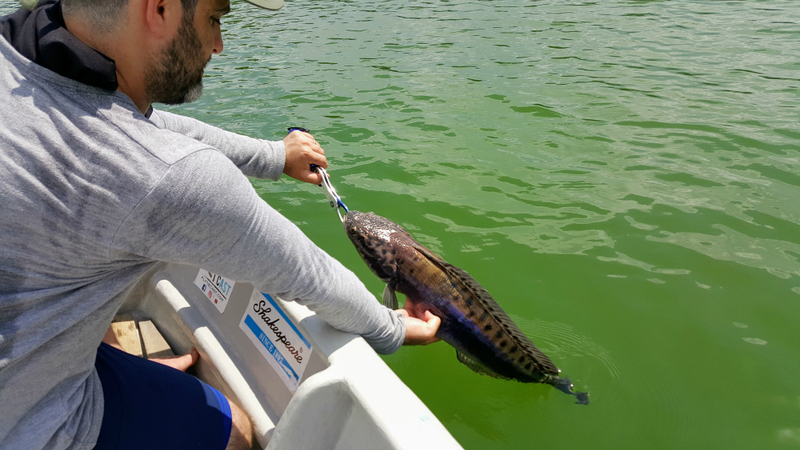 Although Troy did stated that catching Giant Snakehead is far more satisfying, reaching the objective supersede everything. 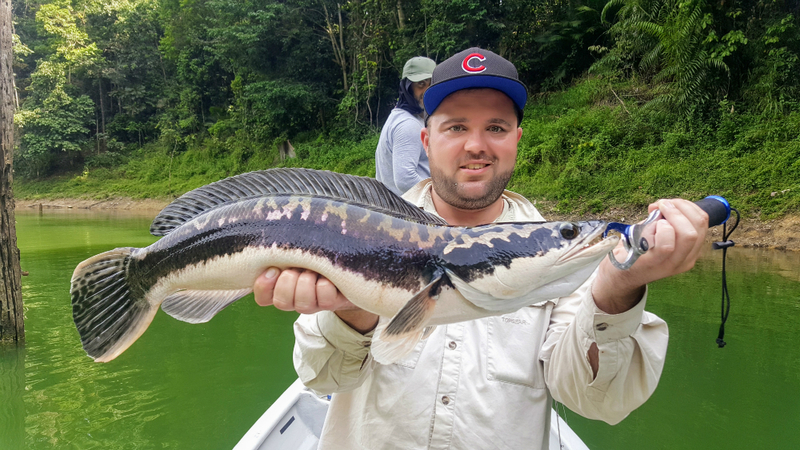 Joel finally landed his Giant Snakehead! Phil battling a Giant Snakehead! Biggest Giant Snakehead of this trip! Way to go Phil! Safely catch and release! 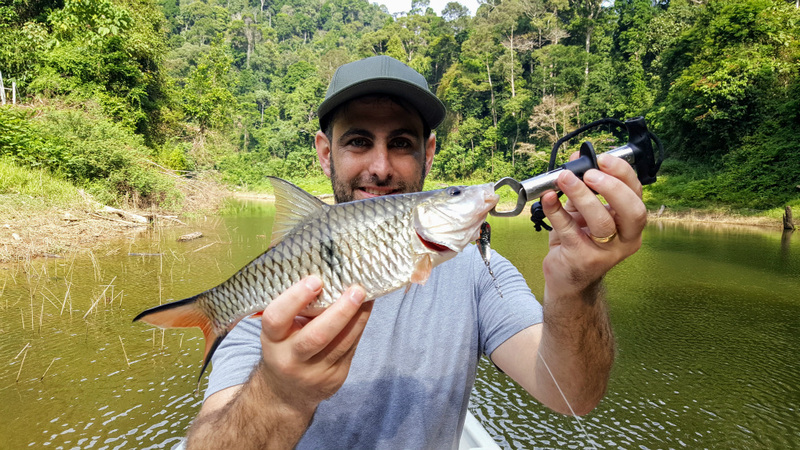 Malaysia freshwater gamefish! Sharp teeth! Dont stick your finger in its mouth! 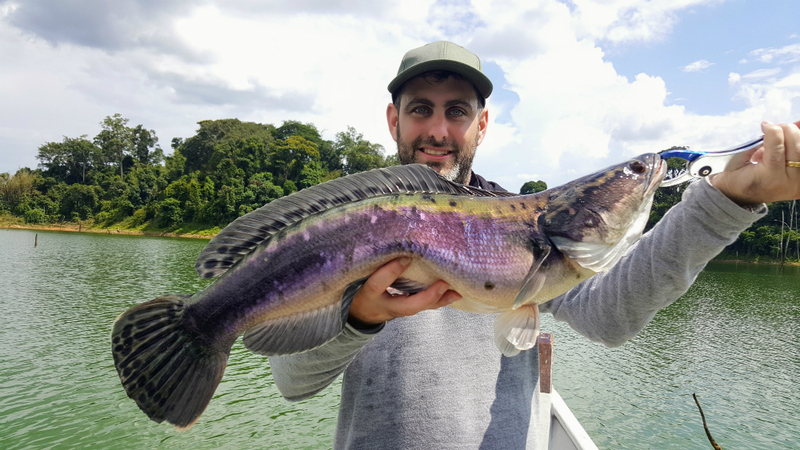 Joel with another trophy Giant Snakehead of Royal Belum! Joel, Troy and Phil Royal Belum Fishing Adventure doesn’t end with fishing. They will continue to experience Royal Belum sight visit to Sg Kooi Water Fall and Orang Asli village. Water droplet formed from the Kooi Waterfall feels cool and refresh. 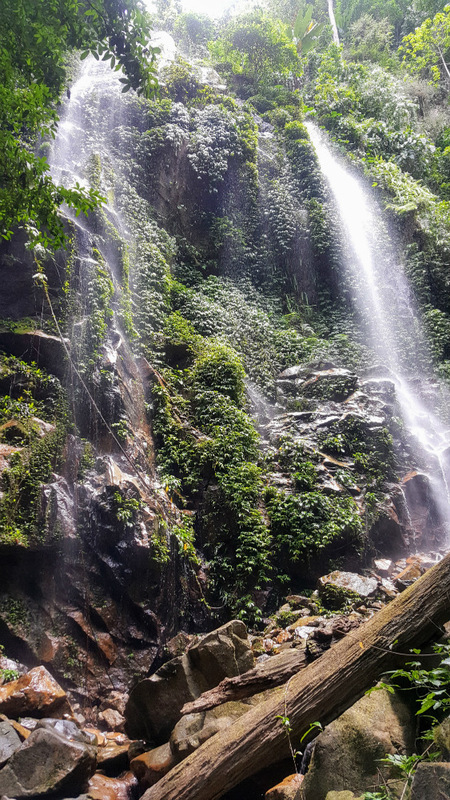 Furthermore the waterfall is in the thick jungle, the Royal Belum Forest in Gerik, Perak. The breeze blows nicely among the various trees, the chirping of various species of birds and the occasional murky sound of consolation, was quite conciliatory. That’s the feeling when we first saw and was at the Sg Kooi waterfall. The waterfall itself is one of the most interesting in the forest. Done with fishing, time for some sight visit! Stop over for a nice cooling shower, away from the heat. 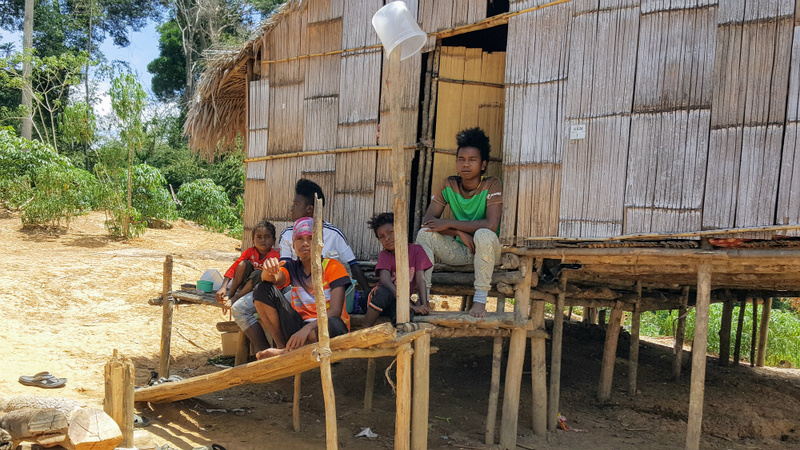 If you are visiting the Royal Belum Forest Reserve at Pulau Banding, Grik, Perak, be sure to visit the indigenous people living in the Orang Asli Village. The majority of indigenous peoples are the Jahai Tribe. The Jahai tribe is the main sub-ethnic of Negrito. Here, Joel and his buddies will be able to participate and learn the survival techniques practiced by indigenous peoples. The Jahai People has been living in this area for thousands of years. Chit chatting with the elder of Jahai Tribe. Blow-Dart is an ancient hunting tools used to hunt Squirrels and Bats for the Jahai Tribe meal. It has been a wonderful journey. 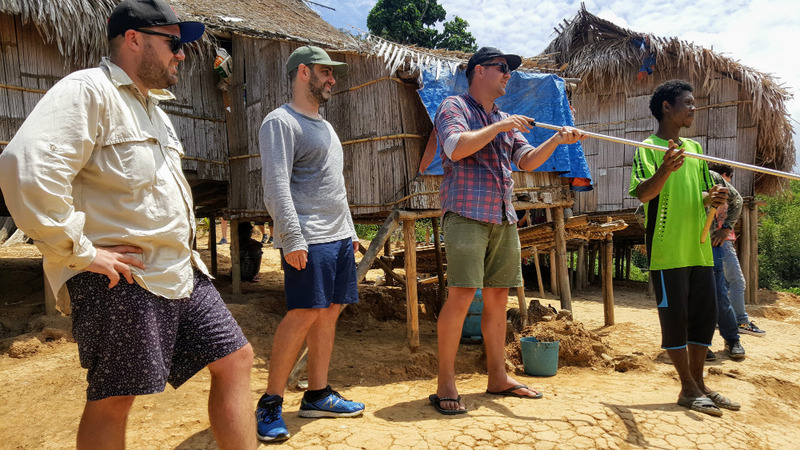 We hope Joel, Troy and Phil had a great time in Royal Belum and their adventure here in Belum will be a once in a lifetime moment. 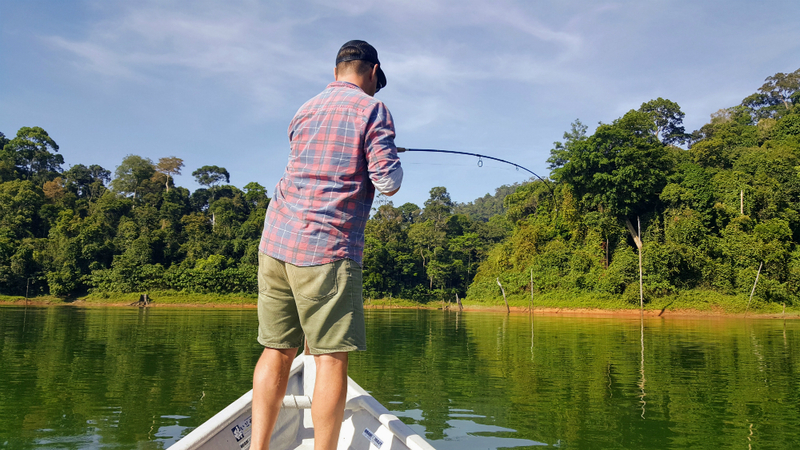 PreviousPrevious post:MARUCOS MALAYSIA FISHING TOUR – PART INextNext post:TASIK TEMENGGOR TOMAN BATTLE!